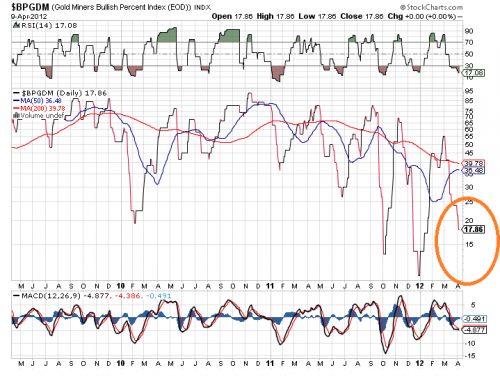 I suspect that not many care much about mining stocks since some have been correcting for a year now. I'll simply post a quote from Mike Swanson as he is talking about gold stocks. 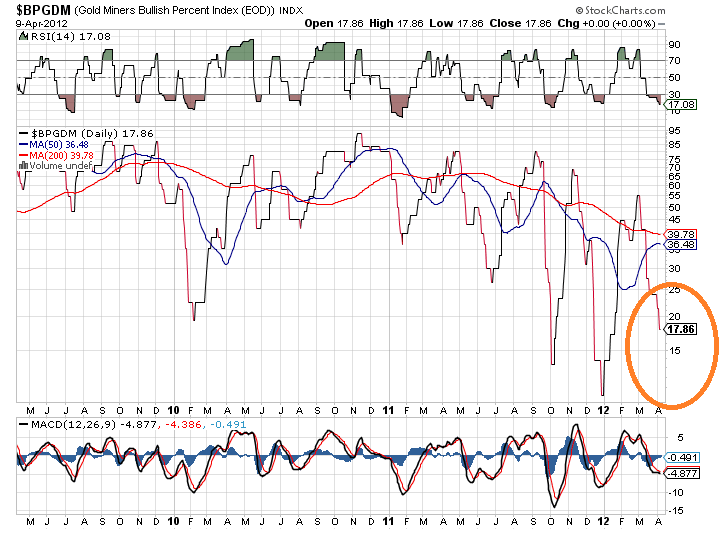 "They may have reached a bottom now or they may do it later this spring or summer on a broad market pullback. My bet is on the latter, but probably not from prices too much lower than here. 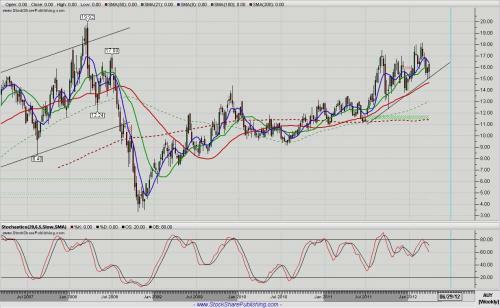 AUY is holding up fairly well along with the consolidation in gold. I don't see how you get much inflation when everyone is hording (mainly banks) all the newly created credit. The must have things like oil are going up in price but even that is curtailed with consumer driving less, get stuck in a loop of driving less still costs more. The SOW seems to have hit fair value when denominated in current funny money and can only attain new highs if consumers spend, which Congress and the Federal Reserve can't seem to invoke. Deflation will begin eating away at regular stock pricing unless another round of money pumping sets in. Miners go no where until big money shows some interest in the shares which will probably happen after spots put on a move. 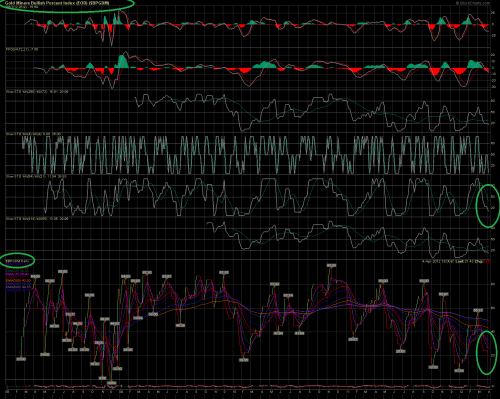 Entering the Weekly Stochastic "buy zone". 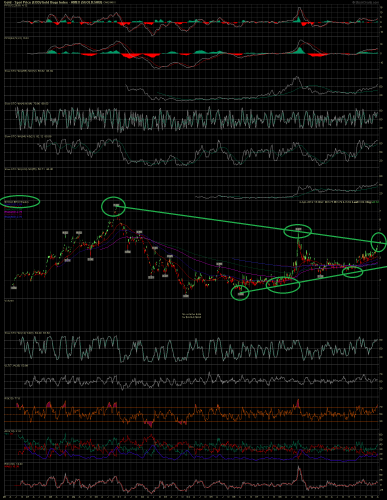 Flirting with the lower trendline of an expanding triangle. And nearing an important zone of support/resistance zone at or just below 425. An election year, so not to wild as they try to hold oil and gold down and hope they can get the markets to at least go sideways. As someone somewhere else said, it's not the stock market but the Federal Market as they have the front-man banks trade between themselves and try to persuade the big funds to go along for the ride. Consumers are still the long term trend setters and without their participation all manipulations are an exercise in futility. Sure there will be some kind of low soon and a typical pop in May and then down until around August 1st. 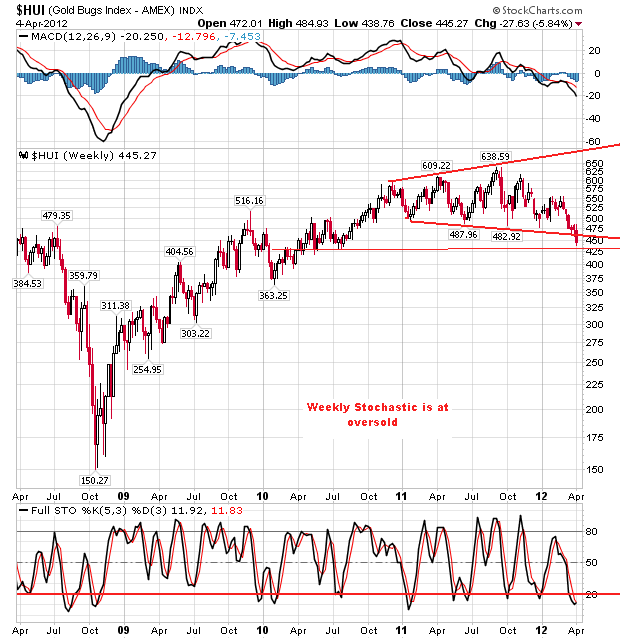 Even trading stocks is tough if deflation isn't countered with more QE. Consumers probably hunker down until the Supreme Court has it say. Not that it will help either way because of debt we are all doomed, but it (the decision on obummer care) is still an unknown of how fast we crash and burn in the long run. Things get worse before they get better. Gold may not make new highs for another year or two. The bright spot is silver, they can't get it to crash through the $30 level. 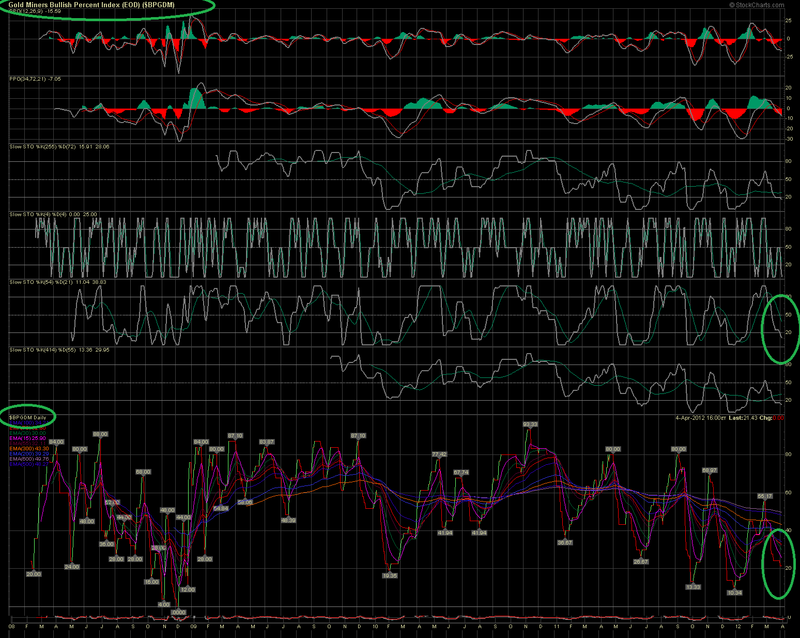 Once silver bottoms then silver miners will be the place to park most of your trading money. No rush though, it will take some more time especially if this PM bull runs 25 years instead of 20.
political settlement appears to have been brokered in Mali following the recent coup with an agreement by the military junta to reinstate the country's Constitution. The president of the national assembly is to act as head of state and oversee the appointment of an interim Prime Minister to oversee the return to a democratic system. The former President, Amadou Toumani Toure, who had been due to step down this month anyway, has formally resigned as head of state and as a consequence the country's neighbours have lifted the sanctions which they had imposed following the coup. These had disrupted the flow of supplies into the landlocked country, notably of oil, which would have had the potential of bringing the mines to a halt. The Mali coup was an unusual one in that it primarily was caused by unrest in the Army which felt it was not being given sufficient support and supplied to counter a Touareg rebel insurgency in the north of the country, rather than one of overall political opposition. To an extent it has thus perhaps been easier to re-implement an initial consensus hopefully leading to a rapid return to democratic rule. Too bad, even though the HUI was traveling and consolidating sideways it was also forming a bearish rounding tops formation then broke down. 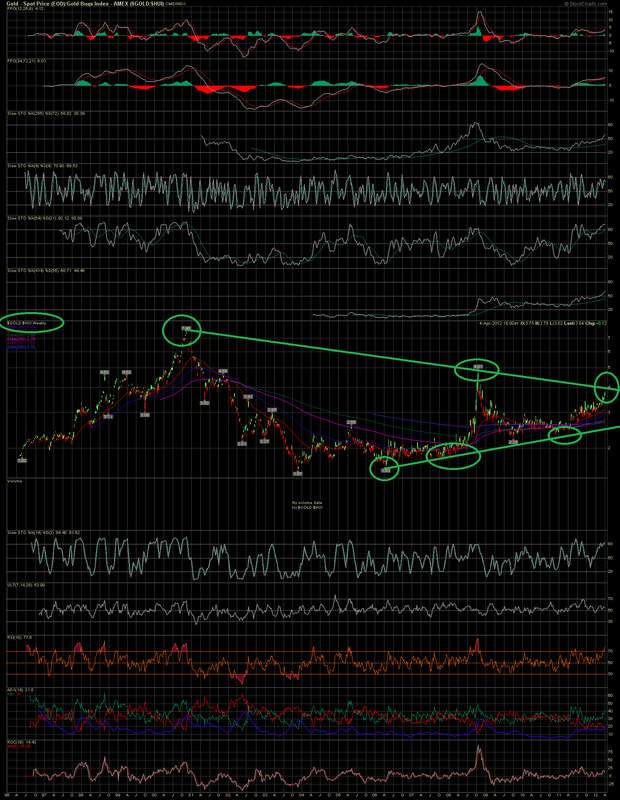 Hard to find a bottoming support line but this might be it short term. RGLD beginning to lead today after this latest sell off seems to be ending (in miners). Bargain hunters in miners ignoring the regular 'Federal Market' place downward action that is begging for more QE. Going to guess that tax receipts are weak. 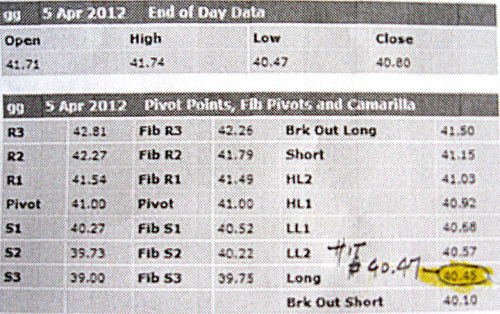 GG's pivot points indicate it's low was put in April 5 at $40.47. It also made a Chapman Wave Peak "F" Bottom on the daily. So what goes down will now go up. When I was checking my past uploaded charts and pics to see where I might have gone wrong with my latest uploading failure, I noticed that one of my pics had been downloaded over 500 times (maybe 5 times for a chart or pic is typical). All the guilty downloaders know which pic I'm talking about, u bunch of sic fuks. 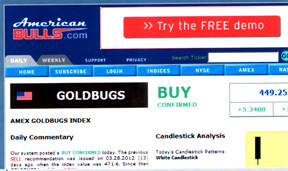 On the American Bulls site the buy was confirmed yesterday April 10th for the Gold Bugs Index. anally digger due to lack of interest.